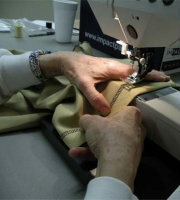 And today nearly 40 people came to sew – that’s right – sew! For around three years they’ve met once a month to sew children’s clothing that is then sent around the world (to missionaries and charitable organizations). As the clothes are given to children in need, a door is opened to share the One who has given us hope and peace. In fact, before today, 6,610 articles of clothing have been made and sent through these servants. Here at FBC, there is no excuse for anyone not to be impacting the Kingdom of God. If someone is interested in serving (and we should – just consider the verses above), there is a place and a way. If that person can’t figure out how on their own, some of us are more than willing to help them. You can do it! Will you? Amen….i love serving at our church and at fbc pas when we are there…..doors are always open…what we do on a daily basis can most lively be done at church serving others. So great your vision in serving and reaching other’s.